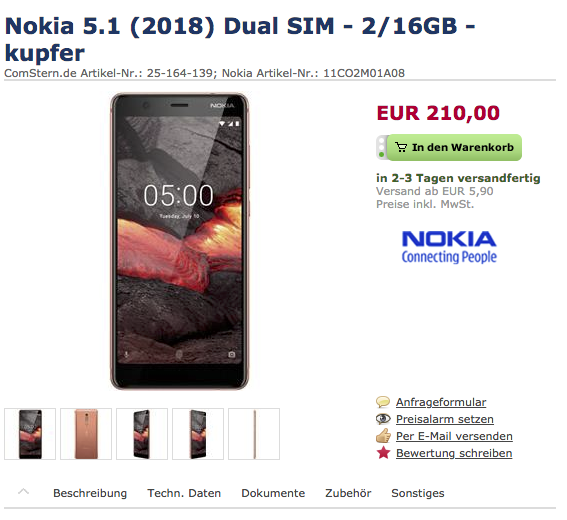 Nokia 5.1 is the successor of the Nokia 5 which has been spotted on a German online retail going for pre-order. This entry-level smartphone will be available in 2GB and 3GB RAM variants with 16GB and 32GB storage options respectively. A couple of months earlier, we have seen HMD Global announcing many new smartphones to come to Europe and Nokia 5.1 was also on that list. Nothing about the global rollout and global pricing is known for now but expect it to be announced soon. The Nokia 5.1 will be coming with a 5.5-inch touchscreen display with front glass and aluminum body design. The resolution on the handset is 1080 x 2160 pixels with 18:9 aspect ratio. Although the smartphone has Corning Gorilla Glass protection, it is not mentioned which version of it is being used here. Under the hood, there is a MediaTek Helio P18 processor with eight cores (4×2.0 GHz Cortex-A53 & 4×1.2 GHz Cortex-A53) coupled with either 2GB or 3GB of RAM and Mali-T860MP2. On the camera front, there will be a 16MP camera with PDAF with dual LED flash and dual-tone flash. On the front, it has an 8MP selfie camera. There is a fingerprint sensor on the rear and also a 2970mAh battery to power the handset. There are all the other connectivity options like Wi-Fi, Bluetooth, USB 2.0 and a few more along with sensors that are required for the device. It will come with Android 8.0 Oreo operating system out of the box, and also has a microSD card slot to extend the memory up to 256GB via microSD card slot. What do you think on this entry-level device? Will you buy this handset? Comment in the section below and stay tuned to Android Advices for more similar news and updates These devices are priced at €210 and €238 for the 2GB and 3GB RAM variants respectively.